Buxton is famed as the gateway to the Peak District, one of Britain’s 15 National Parks, yet it’s within 30 miles of the cities of Manchester, Sheffield, Derby and Stoke on Trent. The town is well served by bus services to and from local towns and by train to Buxton’s own station with direct services to Manchester via Stockport – where there are connections to London, Sheffield and Liverpool. Fresh water springs were discovered by the Celts but it was the Romans who first formed a settlement naming it Aquae Arnemetiae or Spa of the Godess of the Grove, and the mineral water, which emerges from a group of springs at a temperature of around 28˚ centigrade, has been famous ever since. There are also cold springs and a supply of chalybeate (iron bearing) water in the town, which took the name Buxton in around 1100. Buxton’s renaissance as a spa town dates from Elizabethan times; Mary Queen of Scots stayed in the town taking the waters during the 1570s, whilst in the custody of the Earl of Shrewsbury, and he built a hall – in fact a fortified tower – over the baths to provide her with secure accommodation. The hall is now part of the town’s very characterful Old Hall Hotel, which is reputedly the oldest hotel in England. 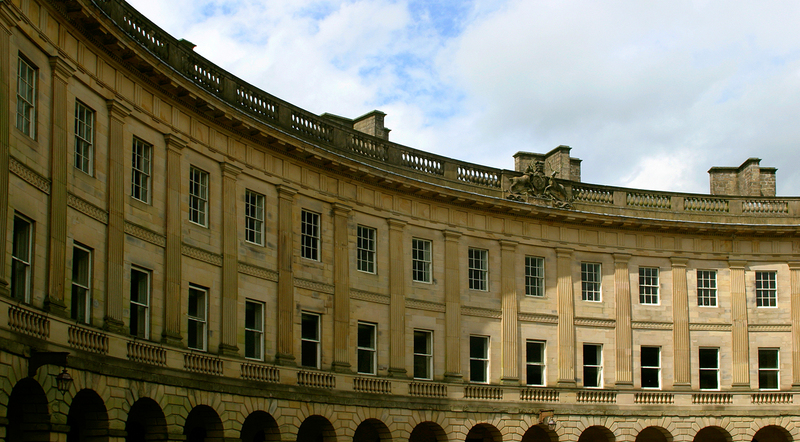 However, it was the 5th Duke of Devonshire, descended from Bess of Hardwick and her first husband, William Cavendish, who put Buxton firmly on the tourist map when he developed Buxton Crescent in the 1780s. Conceived to rival the Royal Crescent in Bath, it was linked to the natural baths and included two hotels linked by apartments, shops and magnificent Assembly Rooms. This nationally important building is being restored and will re-open in the next year or so as a five-star spa hotel with mineral water literally on tap, and with the natural baths (the present ones date from the 1850s) forming part of the hotel’s spa treatment rooms. Additional thermal and hot baths were built in the 1820s featuring impressive Minton tiles. Now the town’s Cavendish Arcade, the building boasts a selection of speciality boutique shops set amongst the original tiles and plunge bath. In 1894, a Pump Room was built in the Crescent. It remained in use until 1981, but is due to re-open this year. Next door to it is St Ann’s Well where residents and visitors alike can sample the delicious Buxton water – the 5,000 or so years of filtering through layers of limestone to reach the surface removes any sulphurous smell or nasty taste. Bring a bottle to fill! The 5th Duke also built an impressive set of stables for up to 120 horses and for the servants accompanying visitors to the Crescent. The Great Stables has since been roofed over with an enormous Dome – its circumference of 46 metres making it the largest unsupported dome in Europe. Now part of the Universty of Derby campus, groups are able to visit the Devonshire Dome to look at its architecture and to understand its history, which included several decades as a hospital. In addition, groups are welcome to use the café or book tables in the restaurant, which, midweek, offers ‘hands-on’ experience to the university’s catering students and presents fine dining at exceptionally good prices. The Opera House, designed by Frank Matcham, opened in 1903. In a dilapidated condition in 1976, it has been brought back to life and restored to the way it looked in Edwardian time, including re-gilding work that required over £80,000 of gold leaf. The annual programme includes opera, dance and drama, and discounted tickets are available to groups. In addition pre-booked groups can take tours of the opera house including its back stage areas. The Pavilion, originally the Winter Gardens, adjoins the Opera House. It now houses a café, conservatory and a gallery featuring the work of local artists, whilst the arts centre and studio provides a flexible performance and conference venue. The Pavilion looks out on to 32 acres of Victorian styled Gardens, which includes an imposing bandstand, lakes, fountain and walkways. Afternoon tea dances and farmers markets (first Thursday of the month) are regularly held in the Octagon. Each year the Pavilion and Devonshire Dome between them host over 75 specialist events, such as the Great Peak District Fair in October, so there is always plenty to do. Meanwhile Buxton Museum and Art Gallery tells the story of the town and its local geology with impressive displays of Blue John and Ashford Black Marble ornaments, alongside temporary exhibitions. Poole’s Cavern is just outside the town centre in Buxton Country Park, it’s walkable by the energetic, but less able members in a group may wish to take the Wonder of the Peak Tram – a quicky electric vehicle that seats eight at a time – and enjoy an informative tour of the town en-route. Described by 17th century poet and writer, Charles Cotton, as the First Wonder of the Peak, (there are seven altogether), Poole’s Cavern extends over 300 meters into the limestone of the hillside above the town, and the guided tours reveal a wealth of history and spectacular stalactite formations.